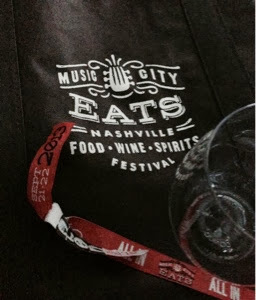 Bob and I attended a food festival for the first time this weekend: Music City Eats. This festival, founded by the Followill brothers of the Kings of Leon band, was a two day food and drink tasting experience sponsored by Food and Wine magazine, Jameson's whiskey, and Cadillac. Many local chefs joined national celebrity chefs, such as Nancy Silverton, Giada de Laurentiis, Ed Lee, & John Besh to showcase their cooking. Never having been to a food festival before, I had no idea what to expect, or how to navigate the festival, and I would do it differently next time. Next time, I would spend much more time talking to the chefs and less time eating the food. I hope. It's hard not to want to taste as much as possible. There was no map of who was where, and I missed several chef's work that I would have liked to taste. But that was probably inevitable, it didn't take long until I couldn't eat or drink another thing. Alcohol was a central part of the experience, many wineries and liquor distilleries exhibited; there was no way one person could taste it all. But I was surprised during the cooking demonstrations by the chefs and moderators who joked at length about how much they drank and about being hungover. The audience seemed unsurprised by an overall acceptance of drinking as entertainment. This reminded me of the 50's, before the '60's made alcohol seem old-fashioned and just not cool. It's surprising to see people acting as though it's acceptable and even cool to drink to excess. The amount of pork products, not just bacon, but meat from various parts of the pig, was surprising to me. I think I've mentioned before that I come from Pennsylvania Dutch stock, which, like Southern heritage, is a background with a pork based cuisine. I'm a fan of pork, but I was surprised by the number of top chefs that chose to serve pork. Also surprising, one group of chefs served beef cracklin's. This use of fat seems pretty different from what would have been acceptable even a few years ago. When I was in high school, the farm boys wore plaid shirts. The city boys wore white button down oxford cloth shirts; the farm kids, and maybe some of the nerds, wore plaid shirts. At this festival, the plaid shirt was the uniform of the 30 year old festival attendee and celebrity chef. Just weird to me. We had a great time. So glad we went.